The AABB’s Relationship Testing Accreditation program is the international gold standard for DNA paternity testing laboratories. The program establishes and promotes the highest Standards of testing quality and care for patients in all aspects of parentage and other relationship testing. Most courts and other government agencies require DNA tests to be performed by AABB-accredited laboratories. DDC initially received AABB accreditation in 1996. In the last four assessments by the AABB, in which the laboratory's proficiency was scrutinized on hundreds of Standards, DDC is proud to have received zero Standard Non-Conformance citations. This is a reflection of DDC's total quality commitment. The American Society of Crime Laboratory Directors/Laboratory Accreditation Board is the most stringent accreditation program for forensic DNA laboratories. The primary laboratory we utilize is currently the only private DNA laboratory to achieve this prestigious accreditation. The CAP Laboratory Accreditation Program is recognized by the federal government as being equal to or more stringent than the government’s own laboratory inspection program. The primary lab we utilize has achieved another perfect rating in its most recent CAP inspection, which examined our general laboratory procedures as well as our excellence in providing molecular diagnostics services. CAP accreditation also requires laboratories to participate in its Proficiency Testing Program, in which CAP sends samples to the laboratories for DNA testing and evaluates the laboratories’ results. Many laboratories participate in this program but do not obtain accreditation, which entails a more rigorous, on-site laboratory inspection. The primary lab we utilize is one of few laboratories that participate in and have perfectly passed both proficiency testing and laboratory accreditation programs. 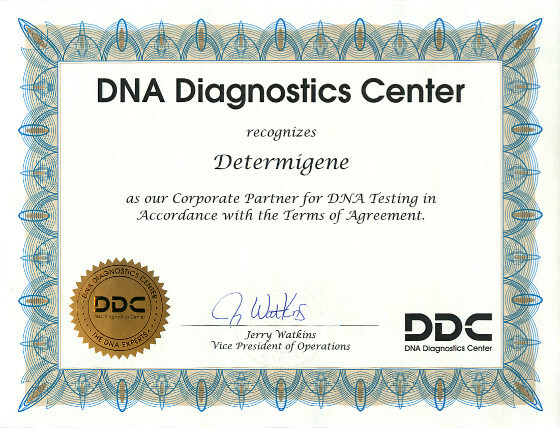 The NYSDOH certification permits laboratories to perform DNA tests on cases originating from New York. NYSDOH rigorously inspects the entire testing service, including processes performed outside the lab, such as chain of custody and patient referrals. The primary lab we utilize is one of the few AABB-accredited laboratories that also possess the prestigious NYSDOH certification, achieving a perfect rating in its past three inspections. The CLIA accreditation issued by the U.S. Department of Health ensures laboratory results are timely, accurate, and reliable. The primary lab we utilize has been accredited by CLIA for over 8 years.